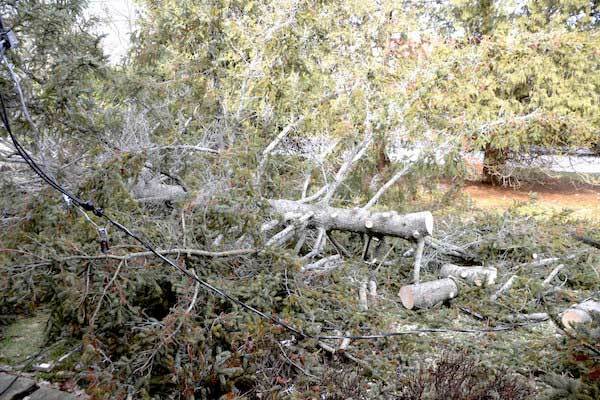 ALBION – This pine tree toppled at about 10 a.m. on Caroline Street in Albion today. High winds have taken down several trees, including that landed up against a house on Taylor Road in Clarendon. Dawn Voorhees of 310 Caroline St. had just put a flag out on her front porch when the pine tree fell. It pulled the electric and cable wires off her house. She was thankful the tree didn’t make a direct hit on her house or porch. National Grid reports that 493 customers in Orleans County have had their electricity knocked out due to the high winds. That’s out of 19,423 National Grid customers in Orleans. The company is estimating power will be restored at 3:15 p.m. The county is under a high wind warning until 5 p.m., with some gusts expected to hit 60 miles per hour. 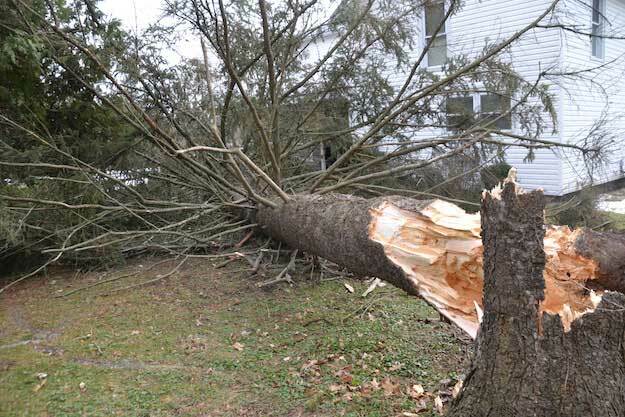 Here is another photo of the pine tree that fell on Caroline Street in Albion this morning.